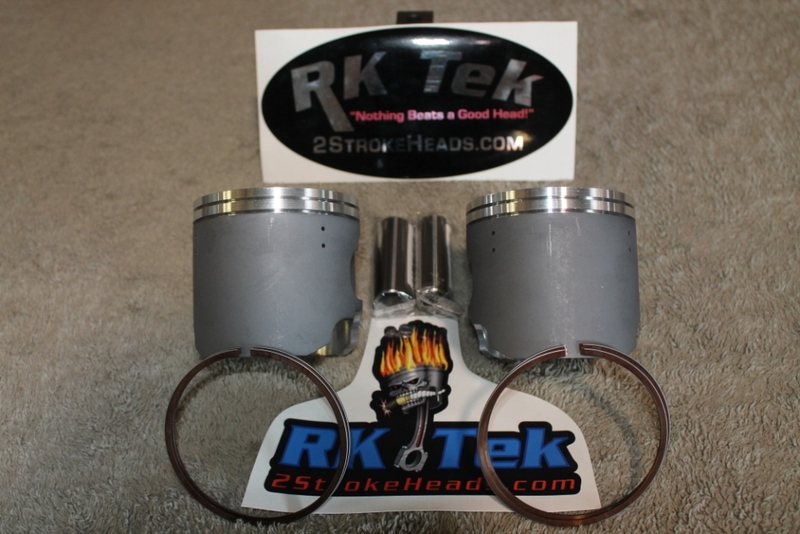 We, at RK Tek, have spent years developing a VERY HIGH QUALITY line of Dual Ring Pistons. These pistons have be PROVEN to aid with power fade and reliability issues associated with the stock single ring pistons. ALL pistons are designed from a blank sheet of paper and made 100% to our spec. They Have been thoroughly tested and proven to work. NOTE: These pistons require no special treatment for using!! You treat them as if they are the OEM piston!! The "KEY" is to design a forged piston that is CORRECT for the high load snowmobile engine.. That is exactly what we have done with our piston line..
Our pistons are not smaller than stock and they require ZERO "extra" warm up over the stock cast piston.. So, in short, it is ALL about the piston design..
RK Tek was the 1st company to recognize the short-comings of the OEM BRP pistons. In 2000, the Ski Doo 700 Twin was introduced with its single ring piston design and it Moly impregnated cast piston rings. We, quickly, discovered that the rings were flaking on any pro-longed pull lasting over 45 seconds. Upon further inspection, we determined that the rings were being overloaded with heat and this would cause the ring faces to "chip" or "flake" and performance would suffer because of this. After countless efforts to remedy this situation (including, Cryro-Genic treatments, different ring materials. etc..) we came to the realization that the single ring was simply inadequate to transfer the heat from the piston to the cooling system. At this point, we decided to find a better suited piston that was equipped with 2 rings vs. 1. This kit is our now, famous, "DROP IN" piston and head kit (over 5,000 sold) where , not only, did we fit the engine with 2 ring pistons, we also gave the engine a VERY nice porting change via the piston geometry. So, the engine would now be fitted with a much better piston and also have a better port timing design than stock. HORSE-POWER was WAY up! This kit has proven the test of time (over 10 years and running) and has put smiles on 1,000's of people faces!! We could not be happier. It took Ski Doo until 2004 to fully realize the issues that plagued their engines (remember RK Tek discovered this problem in 2000). Ski doo only realized half of the issues and decided to keep the single ring design BUT change the ring design to a better design that would not suffer from "ring flake". So, now, we had a better ring but the same old single ring piston. You can read more about the benefits of a dual ring piston and why BRP might have opted for this design in the Tek-Nikal Section of this website. Since the RK Tek designed pistons are so successful, We decided to expand our piston design line to include many other pistons that are specifically designed for snowmobile engine applications! Our pistons have a geometric design that is specifically for the rigorous use that a snowmobile engine subjects the piston to... We also use a different alloy that better suits the snowmobile engine..
ALL if our pistons are tested for at least ONE FULL SEASON BEFORE offering them to the public. Using this method, we can rest assured that they will handle the task without issues. There is no doubt that after 5 years of development on this piston design and manufacturing, that it works and there is no piston that will handle the loads and deliver the performance of this design,. It really is a new evolution in piston design. Using pistons made in Taiwan or China with absurd claims of added silicone etc. and such are simply gimmicks. Try and call China direct and tell them you need only a 1000 pistons and to bump up the silicone a tad for ya!! (ya know change their WHOLE manufacturing and chemical processes for your 1000 pistons) See where ya get with that .. :headbang Yes, you can get a different design with some added holes, bore, markings and what not... but you will never get a different chemical composition of the material itself. Never! These Manufacturers build 100,000 pistons or more every year.. try getting a small number modified.. Not to mention do you speak Chinese?? Go order a new truck from Chevy, Ford or Dodge and ASK for a different seat pattern or gauge cluster etc. etc. (simple enough eh?) for your truck.. See if you get it??? Not happening.. and that is in the USA to boot!! Give it a shot.. they will be totally unresponsive..
Long story short.. all pistons are NOT created equal.. there are many differences in chemical composition, machining processes, metal alloy, and of course, design criteria.. You will never see top fuel dragster engines running an "off the shelf" or Chinese piston for that 4-8 seconds. They run very special "Dragster, Nitro," specific pistons to get the job done and done without failure and with max performance..
Why should the snowmobile engine not have the same opportunity?? Now it does!! The stock Ski Doo 800R piston with pin and ring weighs in at a whopping 567 grams. The RK Tek Direct Replacement 800R Piston with pin and rings weighs 484 grams. more power and LESS stress on your crank. The engine will rev quicker and last longer! Here is a list of what RK Tek has to offer to make your snowmobile engine much "happier"